Before shipping a software product for customer delivery, it is very essential to check both the functional and the non-functional aspects of the application. To test non-functional requirements, one of the items you need to do is performance testing. 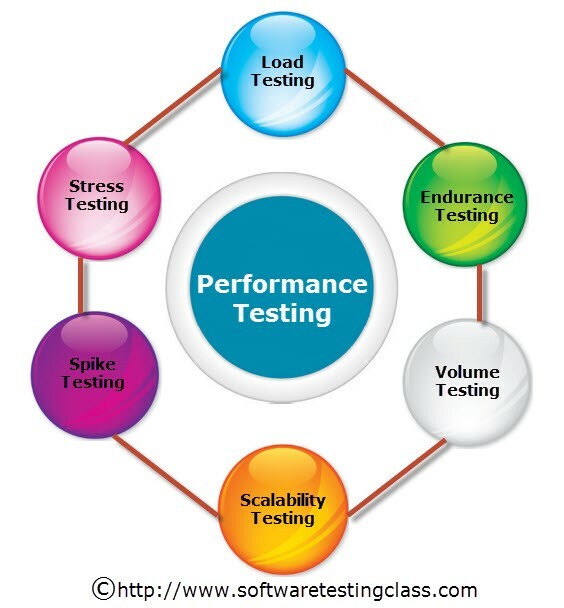 Performance testing is a non-functional type of testing that ensures adequate speed and effectiveness in the performance of a software even under heavy user load conditions. Software performance testing also measures other attributes such as the response time of an application, resource utilization, application stability and scalability under unfavorable situations, and handling errors in such a situation. It does not ensure removal of functional bugs from an application but indicates the overall performance of it. In short, it indicates potential performance slowdown on the client side and helps warn about the end-user experience under load for corrective action prior to its release. Load Testing: This type of non-functional testing is done to examine the maximum amount of load that an application under test can deal with, without affecting its response performance. Endurance Testing: It refers to verifying how an application behaves when subjected to sustainable use by applying a significant amount of load for a considerable period of time. Volume Testing: In this type of non-functional testing, the performance of an application database is analyzed by subjecting it to a large volume of data. The objective of this type of testing is to ensure that the performance of the system remains stable even when the volume of the data processing in the database increases. Scalability Testing: This type of non-functional testing continuously puts an application’s performance to test when there is a change in volume or the size of a system in order to meet the growing number of users. Spike Testing: It is a type of testing mechanism used for determining how an application performs when there is a sharp increase or decrease in user requested load. Stress Testing: A type of non-functional testing that checks how an application behaves under heavy load conditions (mainly above the threshold value) and how it can handle errors under unfavorable condition. In this article, since we would be discussing the features and benefits of using JMeter tool, we would, therefore, focus on load testing. Commonly known as the Apache JMeter, the JMeter is a popular open-source testing tool used for behavior analysis of a web application and performance measurement under heavy load conditions. It is a desktop application written in Java that simulates a heavy load on the web server or networks by creating multiple virtual concurrent users and measuring the response time of the web application when put to test. Why should I use JMeter for software load testing? Testing your product is important in order to avoid certain issues like slowness and unresponsiveness. However, it is impossible to test a website with more than thousands of concurrent users in an integrated testing environment. Therefore, it is hard to predict how your application might perform under severe load conditions in the real world. JMeter helps to overcome this problem and provides an alternative method of simulating the user load much easily. When your company is launching a new e-commerce website and decides to offer a flat 50 percent discount on all items. It is expected that there will be thousands of users visiting the website to avail the offer. When you have designed a website that is going to publish University results at 4 p.m., it is obvious that the site will receive a lot of traffic from University students who will want to view their results. A Performance Test Engineer starts with load testing by executing scripts in JMeter. The results of the script execution are then analyzed through performance monitoring. If after analysis, the performance test engineer finds the response time of the application to be too high, then the application is considered not efficient enough to deal with heavy load conditions. In addition, whenever a developer is developing a new feature, fixing any issue, or implementing a change request, he or she must ensure that a change in code does not leave an impact on the performance of the existing features in your product. A performance issue might pop up just before a major release of a website, which could lead to a lot of trouble at the eleventh hour. Therefore, to enjoy a hassle-free life, start application performance testing from the early stage of software development. It helps you identify bugs at an early stage and easily track the reason behind the performance issue. Now let us check out how the JMeter tool will work when integrated with other tools using Kovair Omnibus Platform. Kovair Omnibus Engine is an Enterprise Service Bus (ESB) platform that connects different tools using Service Oriented Architecture (SOA). With the help of Kovair adapters and plug-ins, the Kovair Omnibus Engine can enable integration between multiple best-of-breed tools. This allows a seamless flow of data exchange between these tools. Therefore, without much effort, one can achieve data migration, data synchronization, and data integration between various tools. It is very easy to integrate JMeter with Kovair ALM Platform. You just need a Kovair Omnibus plugin or Adapter and an agent service to set up the integration process. That’s it! No coding is required and the entire set up is ready to use with mouse click configurations. One can either add the Test Plan directly to Kovair or add both the Test Plan and its Result following the execution of the Test Plan in JMeter. You do not have to access JMeter to view all the elements of the Test Plan. You can directly view the entire Test Plan and its Result from Kovair ALM. Kovair Application acts as a centralized repository where you can link all Test Plans and their Test Results along with the non-functional requirements. This is done by adding the Test Plan and its results directly from JMeter to Kovair. One can also pull in data such as the Start time–Finish time of the test, Duration of the test, Maximum Response Time, Minimum Response Time, Average Response Time, Error percentage. Another benefit of bringing JMeter Test Plans to Kovair ALM using Omnibus Platform is that it allows remote execution of the Test Plan from Kovair ALM interface. Furthermore, after the execution of the Test Plan is complete, the result will automatically flow back to Kovair from JMeter. Users need not log in to JMeter and view the test results. Managers and stakeholders can be easily informed about the performance test results. When the Test Plan execution is complete in JMeter and the results are transferred to Kovair, then an email will be sent to the stakeholders notifying them about the performance test results. The Report will include all details related to the performance test — duration of the test, Maximum Response Time, Minimum Response Time, Average Response Time, Errors, etc. If the results do not meet the expectations, then proper actions will be immediately taken through the business rule — Escalation policy — to notify the concerned person. Based on the performance test execution result, one can create different types of reports such as Pie Chart, Line Chart, and Bar Graph in Kovair ALM. These reports help to analyze the results of performance testing executed over a period of time. It allows you to compare data and track the response time value. If the response time abruptly increases, then you can easily identify the cause behind it. Through these reports, one can easily find out the error and the success percentage of the test results. 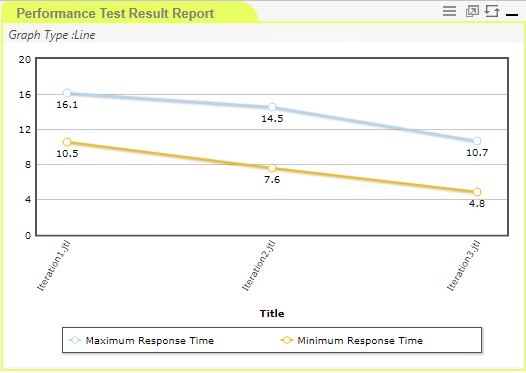 The following figure below shows a Test Result Report depicting the Maximum Response Time and the Minimum Response Time for every iteration. Notice a sharp decline in the response value, which means the performance of the application has grown better. In reality, Performance testing using JMeter makes you feel confident about the stability of your product when used under severe load conditions. It also gradually enhances the performance of your application. When integrated with Kovair Omnibus, JMeter makes your work easier. With all tools integrated into one centralized platform, organizations require minimal effort to achieve cross team collaboration. Since tracking the real-time performance of the test data can be done without even accessing JMeter, you can now track all the work of project members and guide them in the proper direction. JMeter and Kovair Omnibus together can help boost your application performance and stability. Contact us to learn more! Nice post! Thanks for sharing the article about Software Performance Testing. Thanks for all the information you provide through this site. Great information on your site. Keep sharing such informative articles! 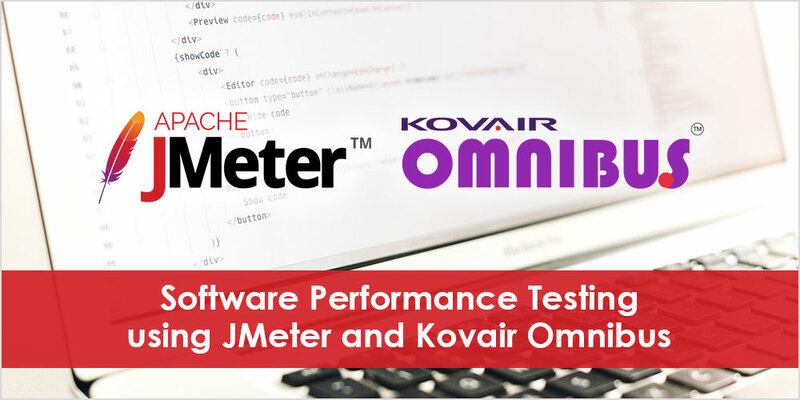 The software performance is valuable for the testing part which is going to make the part done while using the JMeter and Kovair omnibus testing which is going to enhance the most using tools which will help you to make the work easy.